The New York Central's main line once wandered through small towns located at the north end of the Finger Lakes. Once the "Water Level Route" was completed to the north, the original main line became the "Auburn Road" of the NYC, named for one of the villages along the way. 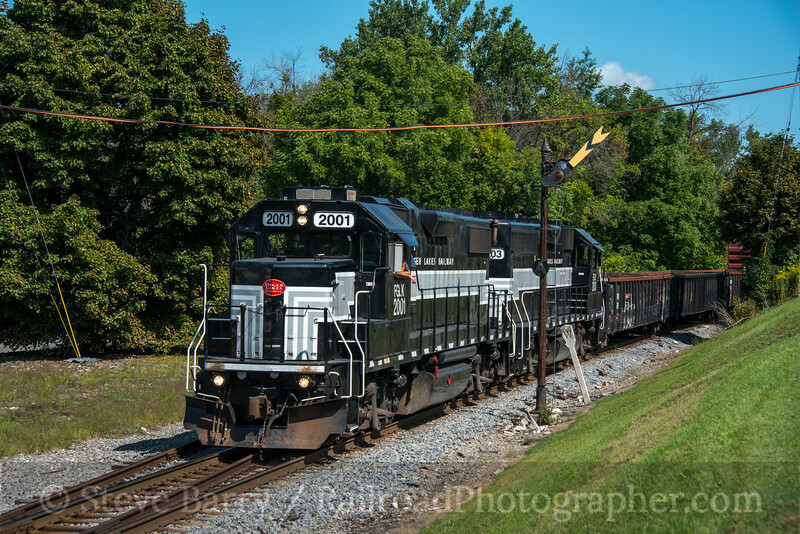 The line eventually became a part of Penn Central and then Conrail, then was spun off by Conrail in 1995 when the Finger Lakes Railway (FGLK) was formed. Mindful of its heritage, the FGLK adopted the NYC's lightning stripe paint scheme for its locomotives. The Finger Lakes Railway is based out of Geneva, N.Y. Its main line, the old Auburn Road, wanders east to a connection with CSX (former New York Central) at Solvay, just outside of Syracuse. 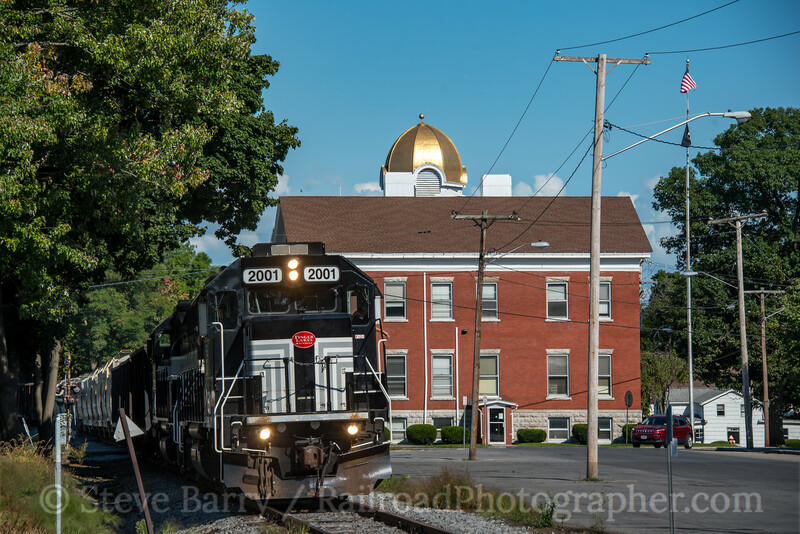 From west of Geneva at Canandaigua to Solvay, the railroad runs 76 miles. 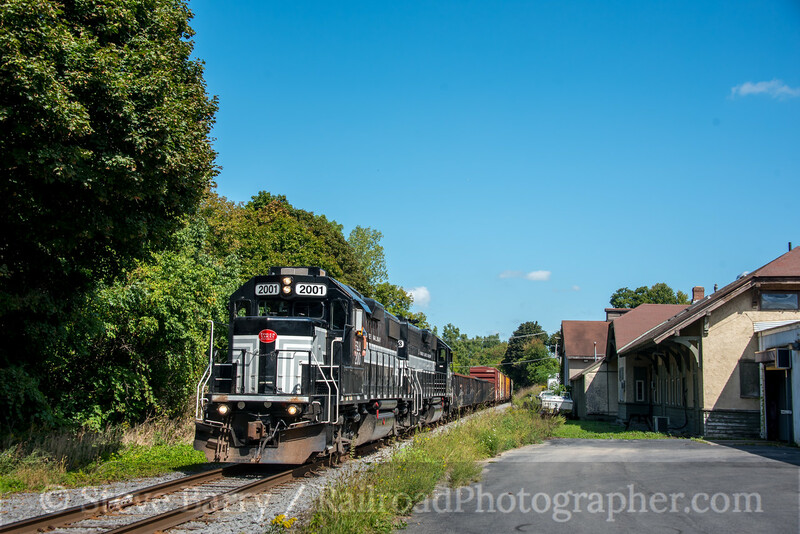 On September 16, 2018, I went looking for a Finger Lakes freight with Mike Burkhart. 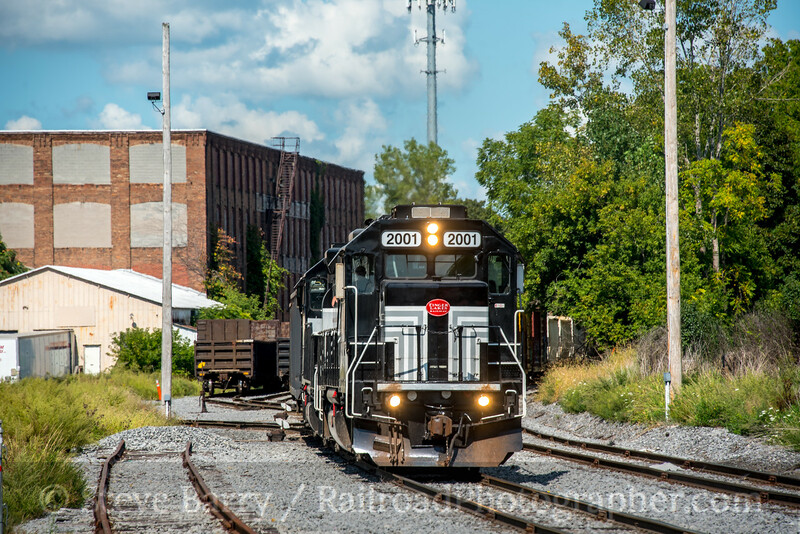 Sunday is a good day to find train GS-2 (Geneva-Solvay), and we found the train just leaving Auburn heading east behind GP38-2s 2001 and 2003. 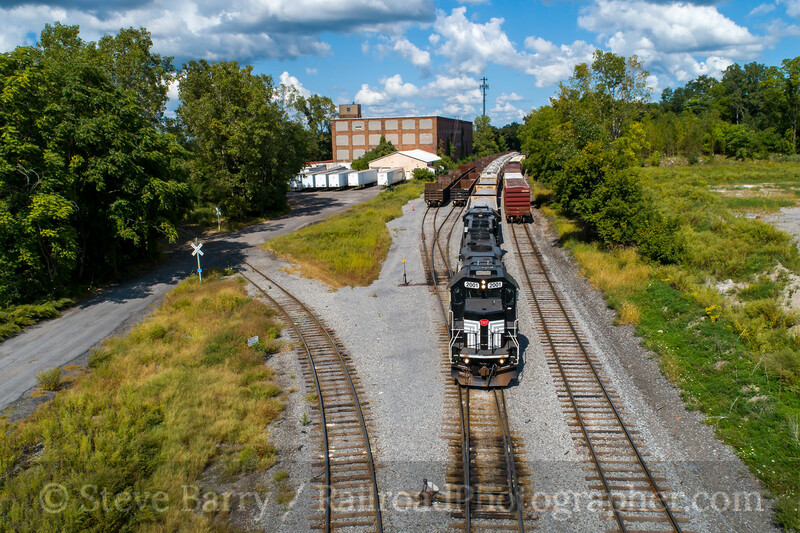 Our first decent shot was at Skaneateles Junction (top photo), then we chased on to the overhead bridge near Martisco. The train really wanders through the woods, but as it approaches Solvay and Syracuse it gets back into suburbia. There are several NYC depots still located along the line, but Home Depot in Fairmount is not one of them (above). Once at the interchange it didn't take the crew long to drop the inbound cut of cars and pick up the outbound loads. It took just 45 minutes from the time the train passed the fixed-aspect approach semaphore for Solvay for it to return past the signal (above). Next up on the chase was the old depot at Camillus, now part of a car wash complex (below). The depot at Martisco requires a bit of a drive into and out, and that will have to wait for another chase. 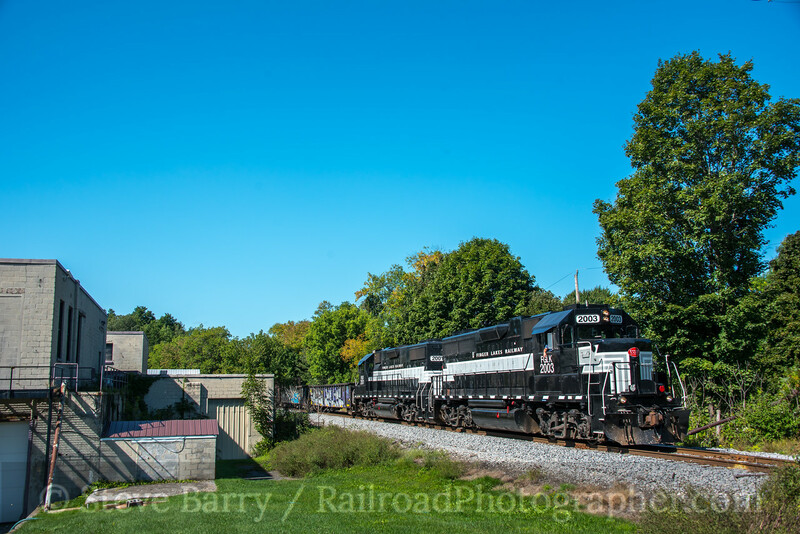 However, the depot at Skaneateles Junction (pronounced "skinny atlas") provided a nice photo prop. The gondolas on the head end directly behind the locomotives were destined to be dropped at Auburn, requiring the train to briefly work the small yard there. With a pause in the action, there was time to launch a drone for an aerial shot. 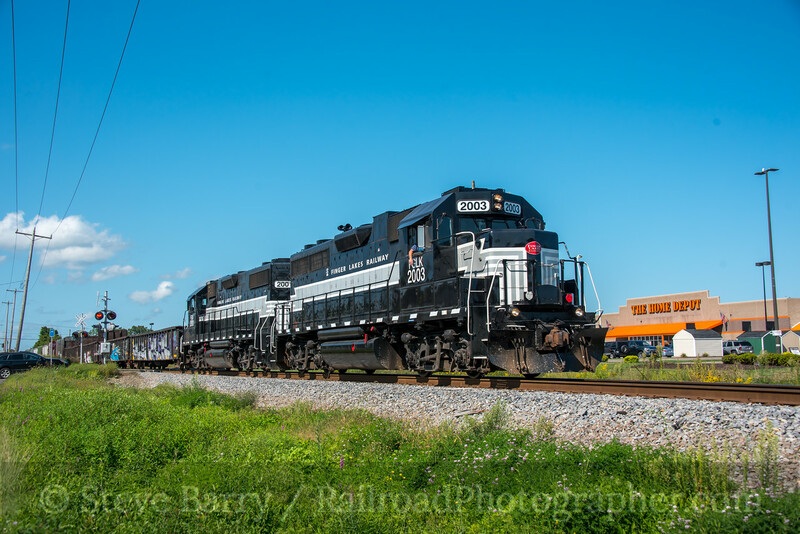 With the work done in Auburn, the GP38-2 duo made short work getting out of town. For most of the chase, the pattern for the train was run fast between towns, but slow down in towns. 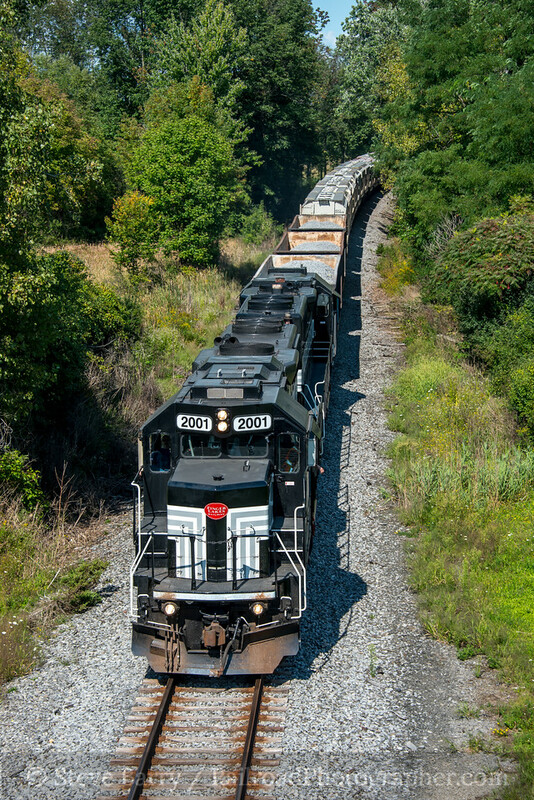 With the train carefully negotiating Auburn, there was time to get ahead of the train as it worked uphill through the S-curves along U.S. 20. 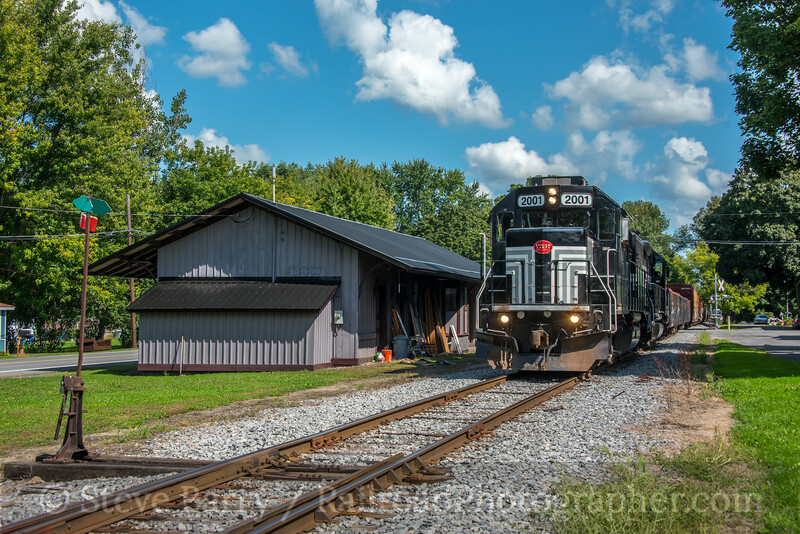 Finger Lakes Railway; Cayuga, N.Y. 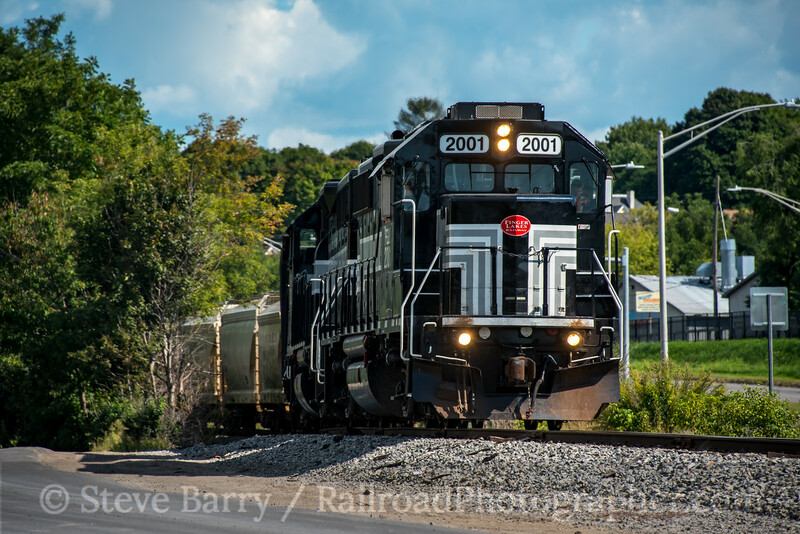 Between Auburn and Seneca Falls, the railroad loops north of U.S. 20, then drops south on its approach to Cayuga Lake. Meanwhile, U.S. 20 wanders north to skirt the top part of the lake. As the railroad and highway wander, they cross each other about halfway between the two towns with the highway passing overhead. 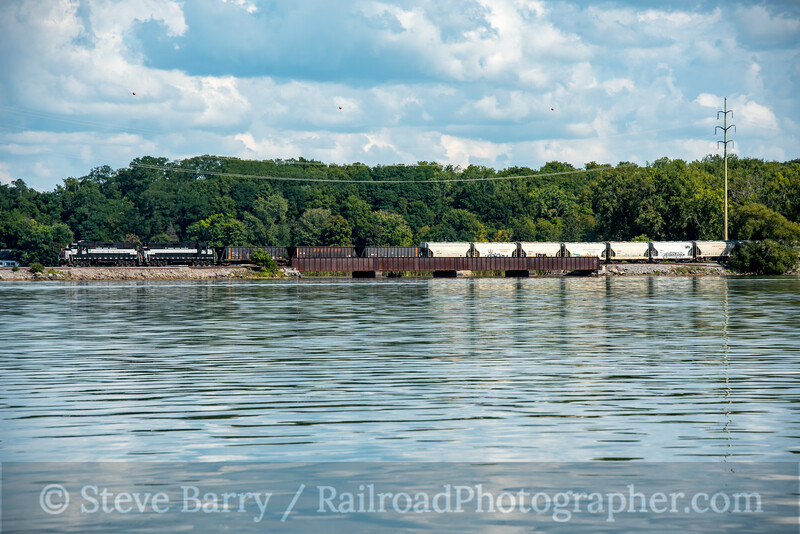 The highway crosses above the top of Cayuga Lake; meanwhile, the railroad leaves the village of Cayuga and crosses the very top part of the lake on a causeway. 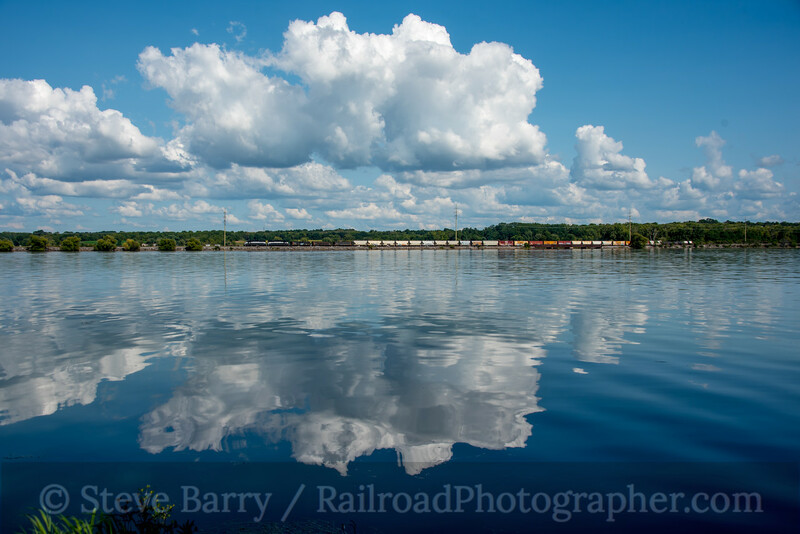 A wide-angle view shows the puffy white clouds reflected in the blue water of the lake as the train slowly makes its way across the causeway. 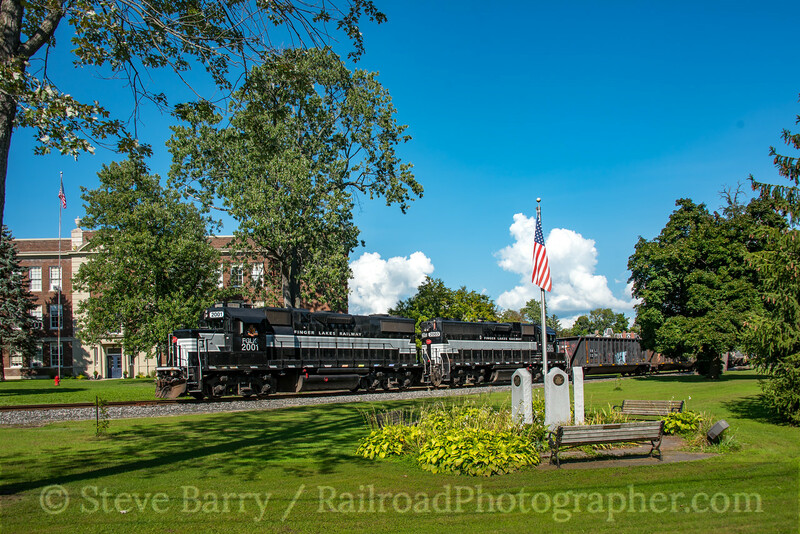 From this point, Seneca Falls is only a couple of miles away, but the train slows down considerably as it approaches the village. There are a ton of neat photo props here, including a NYC passenger station and freight house. We opted to get the scene as the train passed through the town square next to the school. With the chase almost over, the last village is Waterloo before arriving in Geneva. At Waterloo, the Supreme Court courthouse with its golden dome rises above the town. From here the train only had a few miles to go before arriving at the yard in Geneva. We opted to leave the train in Waterloo, capping a wonderful Sunday on the Auburn Road and Finger Lakes Railway.